Members’ Meeting: 15th May 2019 – AGM followed by ‘Victorian Nottingham, as seen through the life of my ancestor Levi Lee’ by Brian Binns. Members’ Meeting: 19th June 2019 – ‘Ichabod Wright, A Victorian family historian’ by Ruth Imeson. Members’ Meeting: 17th July 2019 – ‘In the Service of the Emperor’ by Edward Hammond. Fair – Family Tree Live at Alexandra Palace: Friday 26th and Saturday 27th April 2019. Fair – Genealogy Show at NEC Birmingham: Friday 7th and Saturday 8th June 2019. Fair – Family History Show at York Racecourse: Saturday 22nd June 2019. Carnival – Long Eaton Carnival: Saturday 22nd June 2019. From the first Members’ Meeting in January, the meetings will begin at 7.00 pm. Members have exclusive use of the Archives search room from 5.00 pm. 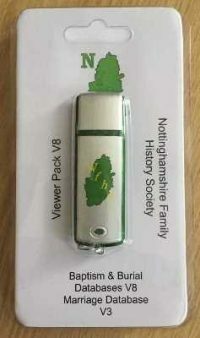 The monthly Members’ Meeting are held in the meeting room of the Nottinghamshire Archives in Castle Meadow Road, Nottingham, NG2 1AG. The meetings are held on the third Wednesday of the month, and, from January 2019, will start at 7:00 pm and finish no later than 8:45 pm. 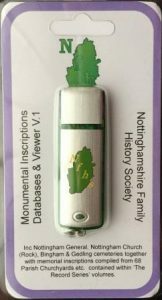 On meeting nights The Society will have exclusive use of the Search Room at the Nottinghamshire Archives from 5:00 pm. The Nottinghamshire Archives fronts onto Wilford Street. It is next door to the Magistrates Court and the HMRC Buildings (formerly Inland Revenue) are across the road. The Archives building is a five minute walk from Nottingham Railway Station, the Broadmarsh Bus Station and the Nottingham Station Tram stop. There are a limited number of car parking spaces at the Archives. NOW available on USB Flash Drive. See our shop for full details.